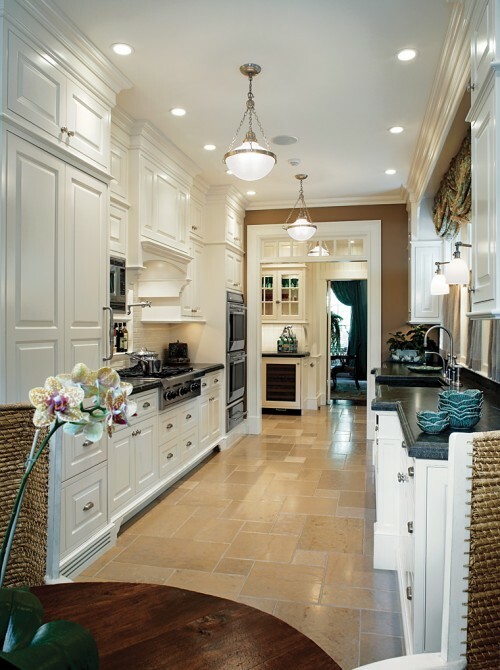 I love the contrast of these white cabinets paired with rich mocha walls. And, isn’t a color in the chocolate family perfect for a kitchen? Gorgeous contrast! You can never go wrong with a classic white kitchen. Seriously fantastic combination! I wish I knew what the chocolate color was called? What a beautiful kitchen. That little bit of mocha really warms things up in there and keeps all the white from looking sterile. Love it! YES! I love it! Thanks for sharing. Beautiful kitchen. Even with the walls being dark, the kitchen still seems bright and fresh. I love those little bowls sitting on the counter! That is a beautiful combination. The dark walls compliment the white cabinets so well. This is beautiful. I love how so much white makes the mocha color that much more important! Happy Friday! Beautiful Kitchen! I love white cabinets! I have antiqued cabinets right now and I do love them, especially because they are so low maintenance. That said I am SO looking forward to finally having my white kitchen in our new house. I am white kitchen obsessed!! Really lovely. Also love (1) that the cabinets go to the ceiling, (2) the lighting and (3) those floors. Perfect! that really is a perfect kitchen color combo. i hadn’t thought of it before! have a great weekend, emily! Fabulous kitchen, I love the wall color and that floor! Wish it were mine. I could even learn to love cooking and learn how to cook if I only owned such a kitchen. choco color is so trendy these days! Gorgeous Kitchen! I am loving those floors! Oh my I am in LOVE! So jealous of the contrast in that stunning kitchen. Amazing! gorgeous! i’ve been wanting that color on a wall in my home! i am not a brown person, but i love this! This is my dream kitchen.. everything is stunning. Would you happen to know anything about the lighting. I love the pendants and the scones above the sink.